As a home inspector, I take the time to discuss the furnace filter with the new home owner during the walkthrough at their home inspection. It is crucial that you change your furnace filter regularly to help keep the air clean in your home. The filter in the picture above had to be at least a year old. The filter is designed to remove the dust and particles from the air flowing in and through your home. A clean filter will allow the air to move freely. 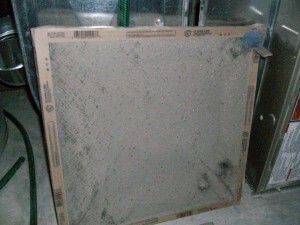 A dirty and clogged filter will cause the furnace fan motor to work harder to move the air. That along with poor air exchange will cause your yearly utility bills to be higher. According to the company that replaced my furnace this year, the “blue, fiberglass looking” type furnace filter is the best balance for air flow and particle removal. The 1 inch thick accordion type filters do a great job of removing particles, but can plug up rather quickly. If air flow is restricted it will slow air movement as well as cause your furnace fan to have to work harder to move the air in your home. Change your filter once a month to keep your furnace system running at its peak performance.